The 2018 E! People's Choice Awards are right around the corner. With just a few days left until the star-studded night, it's time to study up on everything you need to know before the big show. 2018 marks a special year for the award show since it is the inaugural E! People's Choice Awards. With dozens of categories, there will be something for every pop culture fan. Plus, with the year coming to an end, it's the perfect way to wrap up 2018 with the best of Hollywood before ringing in 2019 in just a few weeks. There will be plenty of music. With an opening performance from Nicki Minaj and additional serenades from Rita Ora and John Legend, the show will feature some of your favorite hits from the start. 2. There's a category for every one of your favorites. With 13 new categories, like "The Bingeworthy Show of 2018" and "The Revival Show of 2018," and 43 in total—including six television categories, 10 movie categories, nine music categories and eight pop culture categories—everything you loved this year in Hollywood will be represented. This year's show will feature special awards, including the People's Icon Award for Hollywood funny lady Melissa McCarthy, the Fashion Icon Award for forever fashionista Victoria Beckhamand the People's Champion Award for social justice activist Bryan Stevenson, presented by John Legend. Here's Your First Look at the 2018 E! People's Choice Awards Trophy! 4. You'll see E! 's inaugural show every step of the way. With the show airing for the first time on E!, you won't want to miss any moment. Don't worry—we have you covered from every angle. The event will kick off with two hours of E! 's Live from the Red Carpet: The E! People's Choice Awards followed by the two-hour award show. Jason Kennedyand Giuliana Rancic will be co-hosting the special and even give out a couple of awards before the ceremony even starts. Nightly Pop co-host Nina Parker, The Real co-host Jeannie Mai and E! Style correspondent Zanna Roberts Rassi will also join in on the red carpet fun. The Rundown host Erin Lim will go live from the "Fans' Walk," where fans will get the chance to greet their favorite celebrities. Snapchat will also live-stream the night's first award during Live From the Red Carpet and another surprise in-show event. Meanwhile, Daily Pop co-host Carissa Culiner and E! News correspondent Will Marfuggi will be sharing their live commentary and behind-the-scenes glimpses on Twitter and the E! News app. 5. It's time to tune in. The show can't get started without you watching! You can catch E! 's Live from the Red Carpet: The E! 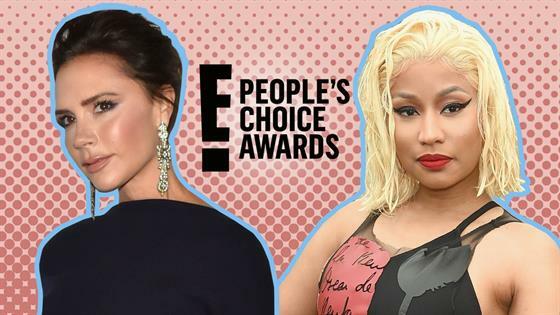 People's Choice Awards on Sunday, Nov. 11 only on E! starting at 7 p.m. ET/PT. The E! People's Choice Awards will follow from 9 p.m. to 11:00 p.m. ET/PT across the cable networks of NBCUniversal, including Bravo, E!, SYFY, Universo and USA Network. It will also air in 161 countries and you can watch an exclusive behind-the-scenes live-stream from Barker Hanger on the E! app, YouTube and Twitter channels throughout the show.